I’ve been trying to find an inexpensive smart plug that is also a repeater/extender. From my understanding, the more repeaters, the better for the mesh network. I see many using cheap WiFi based plugs but it seems to be better to go with zwave or zigbee, correct? Anyone know of a solid inexpensive repeater plug that uses zigbee or zwave? I’m thinking under 28 bucks. I want to add about 10 of them or so around my home. Zigbee repeats only for zigbee and zwave repeats only for zwave, So which repeaters you should get depends on what your other devices are using. If you only have zigbee sensors, for example, There’s no point in getting Z wave repeaters as they won’t even talk to the sensors. Same thing with Wi-Fi: Wi-Fi networks are structured differently and don’t need repeaters as every device will connect directly to the Wi-Fi router. And the Wi-Fi plug cannot repeat for a zwave or zigbee sensor. Device selection also varies somewhat by region, so it depends whether You are using the US or the UK version of the smartthings hub. So it all comes down to what your total device selection will be. I suggest you read the following FAQ. Start with post 11 and read that, then go back up to the top of the thread and read down. It should help answer a lot of your questions. . Then we can start discussing specific device options. 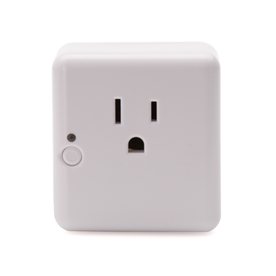 The Iris plug, while not the cheapest, will repeat both zigbee and z-wave. Thanks for all the help and links! I’m looking to install a combination of zigbee and zwave. It seems that it is difficult to find certain items in only zwave such as light bulbs and plugs. For those of you that install Zwave wall switches, how many do you go with? Do you do every switch in the house or use a combination of wall switches and zigbee light bulbs to control all lights? Is there any reason to not replace all wall switches with zwave other than cost? Maybe too many devices? Are you using the US or the U.K. hub? For the US, it’s pretty easy to do the whole house in Zwave if you want to. There are certainly lots of zwave light switches and outlets to choose from. There is a hard limit of 232 zwave devices per network, which is one reason that, although there are some Z wave lightbulbs, most of the lightbulb manufacturers are more interested in zigbee, because then they can sell it as a solution for office spaces and commercial buildings as well. Otherwise, a smart Z wave switch plus regular dumb bulbs will probably be the least expensive choice. Many community members, myself included, have some zigbee smart bulbs and some smart switches of other protocols (Lutron are also popular, which is what I use in my own house) , and each is just selected on the needs for that particular location. I personally don’t replace every switch just for budget reasons. I typically replace one per room. But there are other people who do replace every switch. Different things will work for different households. Thanks a lot for all the valuable information. I think I’d like to go with zigbee plugs since I’m going with at least 1 Inovelli wall switch per room. This way if I do want to use Zigbee light bulbs or any other Zigbee device, I will have a good mesh with Zigbee as well as all the Zwave wall switches. With that said, what is the least expensive Zigbee plug/repeater that you know of? I had purchased the Sylvania 72922 off Amazon, however I received the 72922-A which I’ve been told is not a repeater but only a zigbee plug. I’m told the 72922 without the -A on the end is the plug WITH repeater. I don’t see where that plug supports Z-wave. It’s zigbee like all other iris products. Where did you see that it repeats z-wave? I have all switches changed to smart switches (z-wave) so my z-wave mesh is probably pretty solid. Most of my bulbs are also smart bulbs (zigbee), but a lot of them don’t repeat. I was having issues getting new zigbee devices to stay connected until I moved my three iris smart plugs from the garage into the house. Now I just need to decide what to do with them as they are not being used otherwise. The Lowe’s Iris model 3210-L is an extremely unusual device in that it includes both a zigbee radio and a zwave radio. The zigbee radio is used to control the on/off for the pocket socket and is also is also a zigbee repeater. Z wave radio does not control the pocket socket itself, and is only used as a zwave repeater. It is been very popular in the community as a dual purpose device. BTW, if you look it up on the official zwave alliance products site, it won’t show up under on/off devices, which makes sense since the zwave radio doesn’t turn the module on and off. But it is listed under “network devices” with the single purpose repeaters from other brands. The IRIS Smart Plug is an affordable way to add automation and track the energy use of your home while acting as a repeater for other ZigBee and Z-Wave devices. There were a couple of firmware versions which didn’t work very well, but most people seem to be happy with it. The plug will show up as two different devices in your SmartThings account, One zwave and one zigbee. It’s strange that the pdf document on Lowes regarding the 3210-L model doesn’t say anything about Zwave, only Zigbee. It seems they are missing out on a major selling point by not marketing the Zwave repeater aspect. So if I purchase 3210-L, it is certain that it will have the Zwave repeater feature? yes, I have one in almost every room. It’s there, under “technical specifications” on the second page. Most people don’t know what a repeater is anyway, so I don’t think it changes the marketing any. People who know they need a repeater know to look for it. I use the Z-Wave plug from Neo CoolCam. Available in different pin layout (US/EU/AU). Cheap on AliExpress. Check for the proper frequency! What do you all recommend for a reliable wireless window contact? Depends on your exact needs including your budget. It’s hard to beat the Sensative strips but they are much more expensive than most of the others. Have you had a chance to look at the device class features FAQ yet? What is the difference between the 3210-L and the 3210-L2? Anyone have issues with the L2 plug? Or should I just get the L? They use the Zigbee protocol. Max of 32 Zigbee items.